Leaf – This type of lettuce is the most widely planted and the one most of us use for our garden salads and in our sandwiches. Most of the varieties that fall within this type grows in loose leaf bunches and are pretty high in chlorophyll (green!). 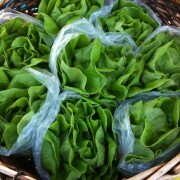 Higher in green the higher the nutritional content – lettuces are a source of vitamin A and potassium. Cos/Romaine – Long stem and long leafed variety that is most popular as the main ingredient in Ceasar Salad. The name Romaine alludes to its Italian (and so then Roman) origins. Crisphead – This is the one known as “iceberg” lettuce. It was adapted for intensive growing in the northern U.S. mainly because it is ships well. However, it contains almost no nutritional value at all. Because of its soporific effect (can make you kind of sleepy) Romans and Greeks ate lettuce after makes to aid sleep. They would also eat lettuce before meals to stimulate appetite. Perhaps these two traditions have survived in diner ritual of salad starter in U.S. and feast’s end salad in France? – Always wash and dry your lettuce very well before eating. – Drying is important. In a salad spinner, air drying, or patting with clean towel or paper towel. Dressing will not mingle well with wet anything. – Never cut lettuce with a knife as it will turn it brown almost immediately. Always tear with fingers into desirable sized pieces. – Lettuce is the base of so many salads, specific varieties sometimes for specific salads. – Leaves are also used as sauce containing wraps or “cups” in a dish. – Tender, green leaf lettuce, especially locally-grown Manoa is delectable sauteed lightly, adding surprisingly subtle nuance to a meal. Look for lettuce free of wilt and damage. Store lettuce in refrigerator, unwashed in sealed plastic bag up to a three days. Some hydroponic or aquaponic lettuce farmers sell heads with root balls still on, tightly secured at bottom of bag with rubber band. Lettuce with root balls kept moist and held upright so as not to damage leaves can keep fresh in the refrigerator for sometimes more than a week. Since we’re in Hawaii, we couldn’t help but look into the history of the locally famous “Manoa Lettuce.” Turn out it is a selection of Green Mignonette that’s been cultivated over the years by horticulturalists at UH Manoa’s College of Tropical Agriculture. The seed variety is officially known as “UH Manoa” and is available for farmers and gardeners. During the 1940’s and 1950’s it was heavily grown by farms in Manoa valley – becoming the lettuce of choice for Hawaii’s tables because of its freshness and tenderness. Yes, we could pretty much grow our own supply of lettuce at that time!